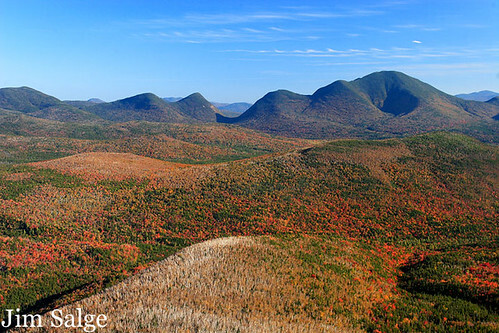 This foliage season is truly turning out to be the best in many years in the Northern White Mountains. Nearing peak, the richness of the reds, and the glow of the yellows is truly remarkable. The weather the past few days has been extremely variable…sun, clouds, fog, thunderstorms, wind, warm, cold, rain, and a few perfect landscape skies. Given the variability, I opted for less hiking this weekend, and more seeking specific sites that fit the weather’s mood swing of the moment. That’s not to say I didn’t put some mileage on my feet. 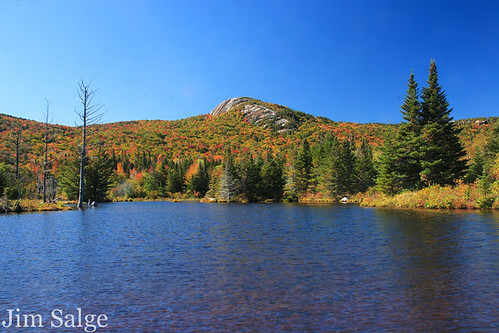 I was able to enjoy short hikes to Ammonoosuc Lake, to Little Cherry Pond, and to the end of Basin Pond. I truly experienced a lot between the shots…got to meet some great people, hiked with olde friends, and saw some things that just don’t translate well in the camera. One such experience was during a short bushwhack yesterday down to the Saco River from Rt. 302 in hopes of finding a view up to a gorgeous red ridge. While walking through, I was noting that much of the area was great moose habitat, so it didn’t surprise me to hear a large animal in the woods just to my left. I didn’t expect that animal to be a full grown black bear. 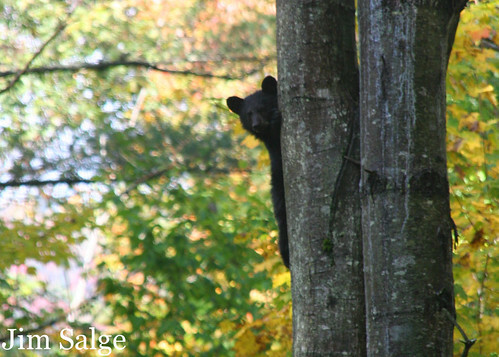 Fortunately we both retreated quickly, but in pausing to confirm the improvement in my situation, I noticed two cubs up a nearby tree. Now, I’m not a wildlife photographer, nor do I have the lenses for it, but I couldn’t pass up the chance to capture the moment. Not for the portfolio, but a fun shot. Additionally, I learned this weekend that not all autumn shots need to be of foliage. 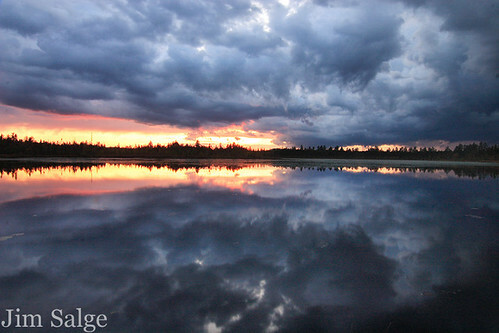 While at Little Cherry Pond last night, storm clouds and calm winds created a stunning scene at sunset. Not at all what I expected to shoot that evening, but a great moment to witness and capture. As for foliage shots, here are a few…I’ll be processing more them this week, and share them here when time allows! Going to Tamworth, Conway and the Eastern Kank this weekend! When I research a location to shoot, I plan to put myself in a location at a time when there is the best chance for dramatic light and atmosphere. Despite the best planning though, the shoot really is at the whim of Mother Nature. 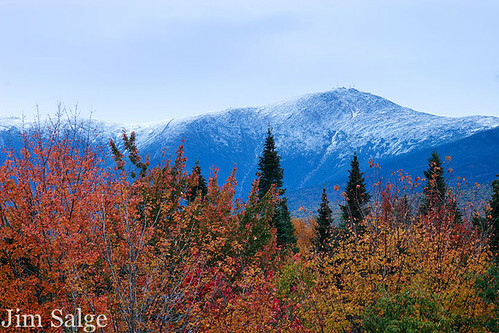 For about a year, I’ve envisioned a dramatic display from Zeacliff as the ultimate White Mountains shot. I dreamed of a valley filled with mist or fog, or a dramatic sunrise over Mount Willey spotlighting Carrigain across the way. 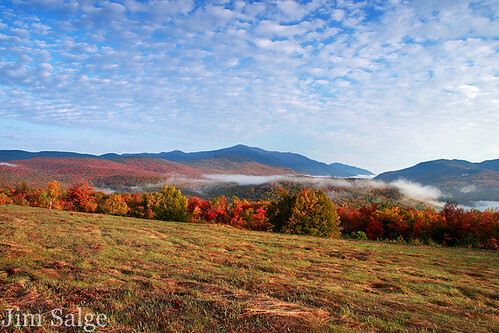 I scouted the location this summer, and tried to time the peak foliage perfectly. Saturday seemed perfect…and the forecast held potential. Crisp and clear during the day; clouds moving in at night. Sunday morning would be an all or nothing sunrise, with the sunrise racing the incoming storm. Though still two plus days from the true beginning of autumn (September 22, 2009 at 5:18 pm EDT), I’ve found that in certain environments, color doesn’t wait for the calendar to switch. This morning I began my annual persuit of morning light and autumn foliage. There is something really special about a misty, frosty and crisp morning. 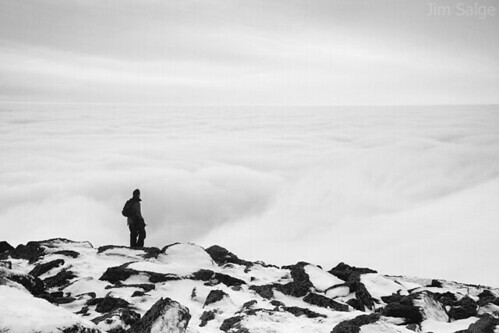 Perhaps it’s the chill itself, or the silence, muffled by the life around’s slowness to stir. Perhaps its the anticipation of the coming rays of light that still bring considerable warmth. Perhaps it’s simply the explosion of colors masked by the cloak of green all summer. Whatever it is, I look forward to photographing this season all year. 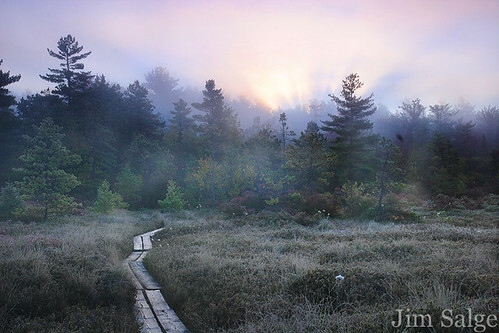 This morning I shot Ponemah Bog in Amherst, the place that nearly killed my camera this past June. I arrived before 6AM to heavy mist and light frost. A great way to begin autumn! I will be quite busy for the next few weeks trying to capture nature’s great display, but will post notes and photos when I can. Thanks for following along! I spend a lot of time outdoors, and much of that time is dedicated to either photographing New England’s rural or natural landscape, or scouting locations to shoot when the light is right. It’s become a bit of an obsession for me. I at this point have a collection of images that I am proud of as a cohesive set; a group of a few hundred images that capture some of the best moments I have seen while hiking, fishing and touring. I’m now at the point where I not only want to share them with more people, but also expand my reach in the business side of photography. Over the next year, I hope to expand the infant brand into a few different business forays. I’ve already taken steps into Rights Managed Stock Photography, as well as Fine Art Prints. Neither have become streamlined into a neat packages yet, and I hope to offer more access and better service over the coming months. I also hope to break into the art fair market, specifically with a line of notecards as well as matted prints. Lastly, I hope that I can combine my love of teaching and sharing with my photography as I begin to investigate the idea of leading photo tours and workshops. Hurry Up … Wait … and Hurry Up! ?